I'm almost finished. She needs a little more work on her face and neck and perhaps an earring. 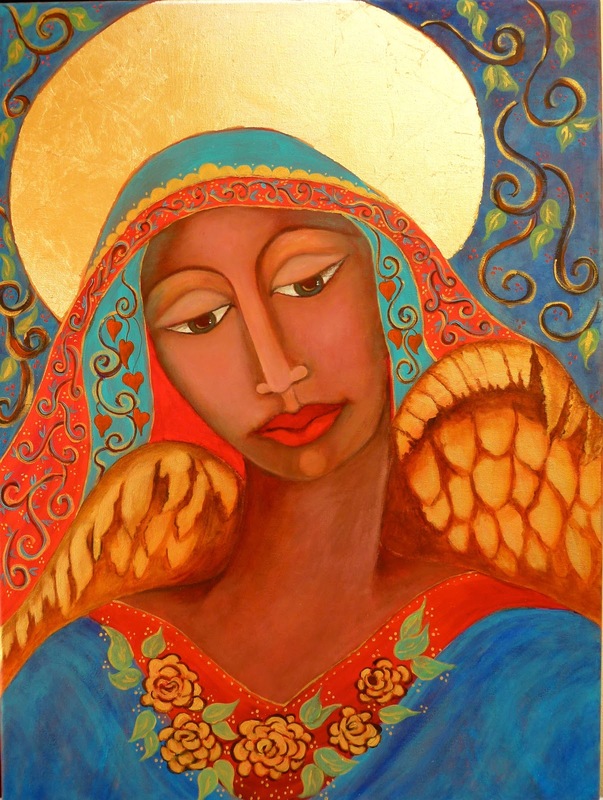 I gold leafed her halo today. Never did that before on a painting, so it occurred to me, after the fact, it would probably need to be sealed to prevent tarnishing. Sure enough it does - a good varathane will do. Of course, I don't happen to have any - so will have to wait until Monday to get a little tin. Then I can seal and antique her halo. Here's her latest portrait. Thanks for dropping in. Nice to see you. LOVE your comments, thank you so much. Take care. Gorgeous...wow. I always love the vibrant colours every time I look at your creations. She turned out beautiful Donna. She is turning more beautiful, Donna! Love all the great detail! Oooooo - magnificent, truly Donna!! I want to try some gold leafing. I have been using a lot of metallic paint, but I have been wondering about that. Need to do a little research I guess.